Delphin Technology AG: Energy efficiency plays an important role in product development and process optimization. Measurement and testing procedures therefore increasingly require precision electrical power measurement. ProfiMessage devices and the ProfiSignal software are equipped with interfaces that enable the easy connection of power measuring units. Combining the high-performance ProfiMessage hardware with precision power measuring units has been proven to work in a wide range of different applications and projects. ProfiMessage devices are equipped with several serial interfaces to enable direct connection of the power measuring unit. ProfiMessage is then able to acquire the voltages, currents and characteristic values that a modern power measuring unit can measure. An internal storage capacity makes this combination ideal for independent, stand alone operation. Process and electrical data can then be acquired, monitored and recorded synchronously and independently of any PC support. 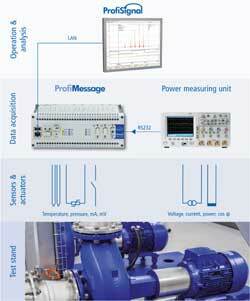 ProfiMessage also has a range of options to enable computations to be performed on the measurement data. For example, efficiency rates can be automatically determined and by integrating the power measuring unit, energy requirements can be computed and monitored. All data is acquired synchronously by ProfiMessage and the power measuring units which can then be visualized and archived via the PC software ProfiSignal. ProfiSignal provides a user interface and enables users to generate their own applications using the Klicks integrated script language. Users can then easily generate automated measurement, test and evaluation procedures. Predefined functions and objects are available to quickly generate views, input templates, test runs, evaluations and reports. We are happy to provide you with our universal technology and expertise to help you with your applications.